On 7th August 1858, the first official match of Australian football was played between St. Kilda and Melbourne Grammar School. On those years Victoria has remained the strength of Australian football. Until recently New South Wales along with Queensland, resisted in the intrusion of Australian football in a major way, and the game played a secondary role to the rugby codes. The game’s uniqueness is seen in many ways. It is played between two teams of 22 players each , 18 of whom can be on the field at once. Historians say that the game was played on rectangular fields, but the game is now one of the very few fields games not played on a rectangular field. a 15m wide interchange on one flank of the oval. The primary aim of the game is to score more points than the opposition. Points are gained by moving the ball over lines between four uprights, each 6.4m apart, at either end of the field . 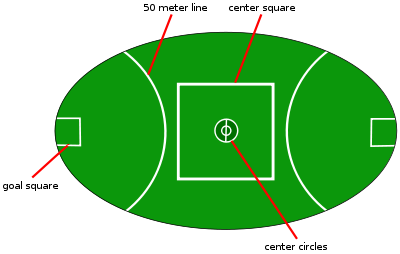 If the attacking team kicks the ball between the middle two uprights without the ball touching any other player or the posts, a goal worth 6 pts. is awarded. A single point is scored for a behind, when the ball passes between the outer posts on either side of the goal or when the ball has been touched by any other player prior to passing through the middle uprights. This rewarding of players for a near miss on goals is a feature unique to Australian football. How Alpaca came to Australia?